After being introduce by his former Chicago Bulls coach Phil Jackson, basketball great Dennis Rodman took to the podium to deliver a heartfelt emotional Hall of Fame speech on Friday. Aug 12. 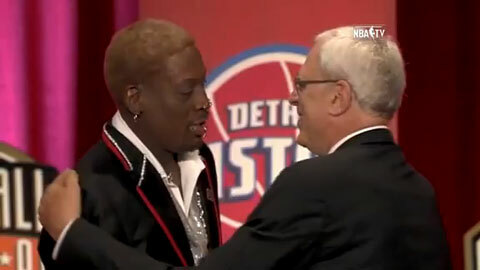 Dennis Rodman shares an emotional moment with Phil Jackson at Hall of Fame speech event. Rodman, known for his colorful and flamboyant lifestyle, was so choked up that he was barely able to begin his speech as he fought back tears and pent up emotions, allowing the audience to see a window into his soul. As Rodman eventually began to speak, he apologized to his children for not being a better father during his playing days. He also told the crowd that he didn’t play for the money or to be famous. “I want to thank David Stern and all of the NBA community for even just having me in the building,” he said. “I could have been dead; I could have been a drug dealer or could have been homeless, I was homeless,” he said. As evidence from his speech, it is obvious that Rodman is basically a good man. PFP Sports and Celebrity Talent Agency is a top booking agent for sports speakers, basketball speakers, athlete appearances, endorsement deals and celebrity bookings. We assist corporations in in booking Dennis Rodman for corporate events. Call 1.800.966.1380 for Dennis Rodman speaker and Dennis Rodman booking agent information.